Custom Audio Program - Can't find the specific pre-recorded audio program you want? Not a problem! Our custom produced Audio Program will take your specific problem area of focus (nail biting, writers block, nervousness, whatever...) and use your own mindset to help you do your own self-hypnosis sessions. What could be easier? Just relax and listen to the custom made program once a day for 20 days. Using the same proven format of the "Relax, Listen and ______ with Hypnosis" audio series (also know as guided meditation) we will create your own Personalized Audio Program on MP3 or CD that you can use over and over again. Please allow 2 weeks for studio production and shipping. This is the best thing next to one-on-one Hypnosis with an Advanced Clinical Hypnotherapist - a custom made audio program from an Advanced Clinical Hypnotherapist created from your own mindset. 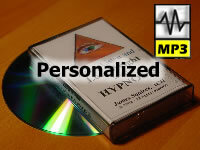 When you order this Personalized Audio Program you will get a URL link to complete a simple custom form online. Listing your phobia, issue or problem area that you want to focus on and "in your own words" give us the details to help us create your own personalized self-hypnosis (guided relaxation) program to help you overcome the issue. Then just do as the title suggests, relax and listen to your "own personalized" self-hypnosis MP3 or CD. Each Audio Program consists of the following format: Induction (relaxing audio with self hypnosis to prepare you for suggestions), Suggestions (created from your online form input, we use your own information to help you focus on your goal), and Awakening (resolve the session to bring you out of the relaxed state). Please, allow three weeks for production time on your custom Audio Program. Upon purchase you will be sent immediately (via email) a link to the online form. Simply complete the detailed portions of the form so we can use the information to create your custom Audio Program. Note: Each Audio Program should focus on one problem area at a time. Since each Audio Program is custom produced there are no refunds or returns.